The analytical framework I use as a foundational approach to understanding the world has changed several times. I went from not having an explicit analytical approach to actively adopting one: scientific realism. Admittedly, I wasn't very good at using it consistently at first, but I found it to be a very powerful and useful analytical approach, later understanding it much better than I had initially when I inherited it from my parents. I moved from understanding the world as a scientific realist, operating through the lens of the methodological assumptions of science, to understanding the world through a sort of pseudo-progressive religious universalist lens as I tried to figure out whether to remain a Christian or become a Buddhist. By that time, I had already rejected the sort of contemporary atheism that often accompanies scientific realism along with my rejection of scientific realism, though I did take that perspective seriously as a live option. Eventually, I learned to utilize some analytical approaches in some areas of life and other analytical approaches in other areas of life. When trying to understand physical phenomena, or social phenomena in the aggregate, I break out the analytical toolkit of science. When trying to understand science itself, I break out the analytical toolkit I obtained from taking too many philosophy courses. When trying to understand philosophy, I break out the analytical toolkit of the historian, the linguist, and the literary critic. When trying to understand historical work...you get the idea. I bring to bear other analytical frameworks on various fields of student to help make sense of them. And often, I use multiple analytical toolkits just to see what happens. But none of this is the foundational analytical approach for me. None of it, not even my epistemology, provides me with a way of understanding the fullness of my own nature, my own purpose, my own meaning. Even with a wide variety of these analytical toolkits, the best I can do is understand a small part of these things. Generally, analysis is a matter of breaking things into pieces in order to understand them. And that's very useful; I do it quite often. But one thing that most analytical approaches cannot do is to help put them together, to synthesize the data into a more coherent and holistic picture of ourselves and our world. For that, we need a keystone in the lovely and complex arch of our beliefs. We need something that holds it all together firmly, something that can make all the pieces of the puzzle of our experiences fit together as they were meant to fit together. This requires that we have a meta-philosophical answer to the Problem of the Criterion. One popular answer to the problem (at least in the West) is Critical Theory. I am not accusing it of being a very good answer, but it does seem to be an answer many have accepted. It provides a sense of purpose and meaning to the lives of many people, which is worthwhile. It provides them with analytical approaches for understanding everything that is happening to them or to their loved ones in the context of our societies. It provides them with a casus belli, a reason to fight for something like a transcendent good: material equality and social justice. And they have the physical sciences to explain the rest of material reality. As do many people who do not subscribe to Critical Theorists' fundamental assumptions about human nature, social relations, and causal relationships. The majority of people who do not accept those assumptions are religious, though not all of them are. Devout practitioners of Buddhism, Christianity, various Hindu traditions, Islam, and many other religions have quite different ways of synthesizing a holistic understanding of reality. Though they generally make some quite different claims, traditional religions consistently have an understanding of human nature, social relations, and causal relationships that is not compatible the assumptions embedded in Critical Theory. These devout practitioners have taken up other meta-philosophical answers to the Problem of the Criterion which are grounded in the central claims of their religion that help them synthesize an understanding of reality. For Christians like me, the keystone is Christ crucified as understood in light of the Gospels and interpreted in light of the traditions of the Apostles and their successors. This is the Christological analysis which leads to a Christian synthesis of our understanding of reality. To be a Christian means to put on the Christian mind by way of adopting the Christological analysis, by understanding reality through making Christ crucified as understood in light of the Gospels the central experience which guides our minds ultimate to Truth. The Christological analysis provides me with the casus belli which moves me to fight daily against my own selfishness so that I might learn to love God more fully, and thereby learn to love all of humanity and the Creation of which we are stewards more fully as well. It is the Christological analysis which leads me to care for the material needs of those who are materially poor, for the emotional needs of the broken-hearted, for the intellectual needs of those caught in the whirlpools of irrationality, and the spiritual needs of those whose souls are restless until they rest in the gentle arms of their Creator. It is the Christological analysis which leads us to act for justice and peace on Earth so that it might reflect ever more clearly the divine Justice and divine Peace which is perfectly present in Heaven. 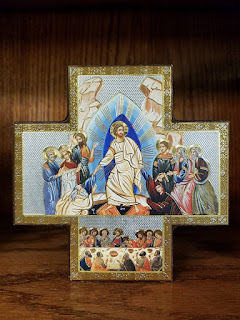 It is Christ's sacrifice on the Holy Cross which shows me the kenosis which is necessary for me to carry out this great commission of Love, to bring Love Himself to all people. 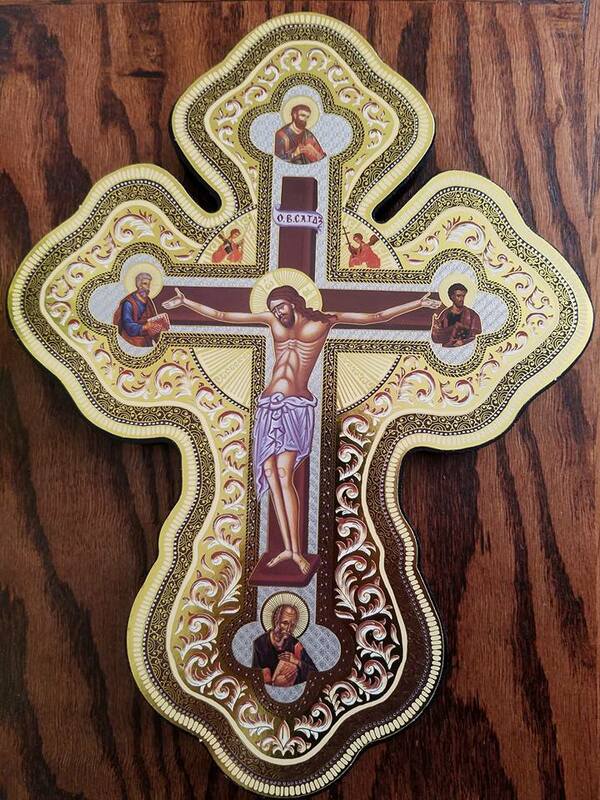 Note: The above is a picture of an icon cross from Greece which recently came into my possession by surprise. 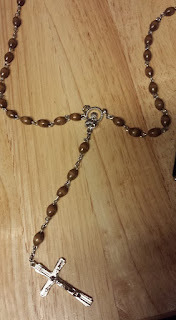 Fair Questions: Why do I have skull beads on my rosaries? As I've mentioned before, there are multiple ways to pray the Rosary. I've prayed the Rosary in many of those ways, and found them all beneficial. 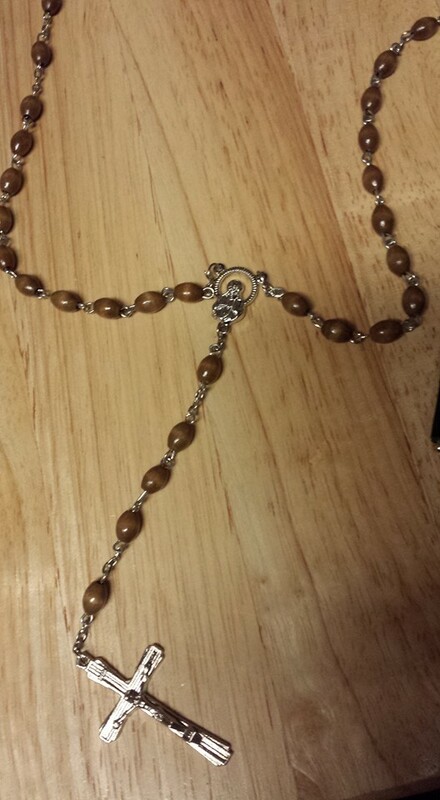 Initially, I didn't set out to customize the Rosary's prayers. I was perfectly content to pray it in the quite beautiful forms it had already taken, whether the more ancient Dominican or popular contemporary form. "Lord, just as You allowed Your Sacred Heart to be pierced by human suffering because You so loved the world, please help me to allow my heart to be pierced by Your divine love because I so love You." The prayer helped me to connect the visual artistry of the rosary with the spiritual purpose of the Rosary. I began to realize that the artistry of the rosary beads, crosses, and medals was not only valuable for instruction in the spiritual life and a practical aid for counting the prayers, but also a means of inspiring deeper prayer and deepening one's understanding of theology. As a result, I began to pray the Rosary in different ways that were also new, though I hope and pray that they flow authentically from the ancient Christian theology and traditions in which I have steeped myself the last few years. Listed below are a few of the ways I pray the Rosary. These are only the ways I pray the Rosary in English, but I pray it in much the same way in Spanish. What I call the Celtic Blood Rosary is based on the quite ancient Dominican way of praying the Rosary. The only difference is an added prayer between each of the decades and at the end of the final decade. "Lord, as I remember Your death upon the cross when You poured out your precious blood for us, the same blood of the new covenant which you give to us in the Eucharist, please help me to remember my own death, that I might be given the courage to pour out my life for You." 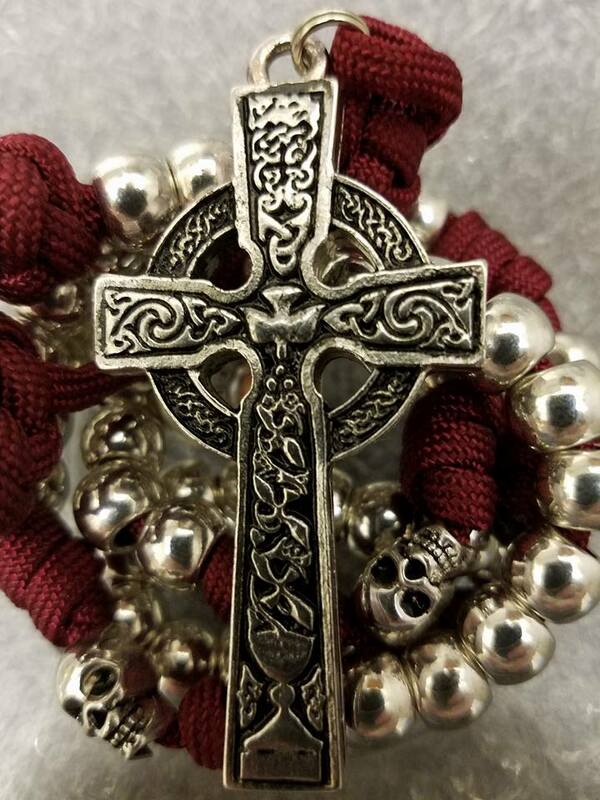 This prayer is inspired by the Celtic cross which depicts the chalice consecrated by the power of the Holy Spirit, thus filled with Christ's precious blood under the appearances of wine. It also draws upon Sacred Scripture and Christian mystical theology. The Sister Death Rosary is inspired by the Franciscan-style rosary with the San Damiano icon cross. 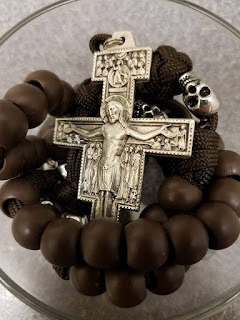 I pray with this rosary in the more popular contemporary form, though I pray an additional prayer when I come to each skull bead (there are 6 of them). "Lord, please help me to welcome Sister Death, just as your holy servant St. Francis of Assisi welcomed her at the hour of his death." Those familiar with St. Francis of Assisi know that he had a tendency to refer to everything as Brother or Sister (i.e. Brother Sun, Sister Moon). Those familiar with the story of his death know that he greeted his own death by the appellation Sister Death, whose embrace he understood to be both inevitable and natural, not something to be feared. The Remembrance of Death Rosary was inspired by the Rule of St. Benedict's instruction to "Keep death daily before one's eyes." and my reading of St. John Climacus' The Ladder of Divine Ascent, which devotes an entire chapter to the remembrance of death. I pray this Rosary according to the Dominican form, though I add an additional prayer when I arrive at each skull bead between the decades. 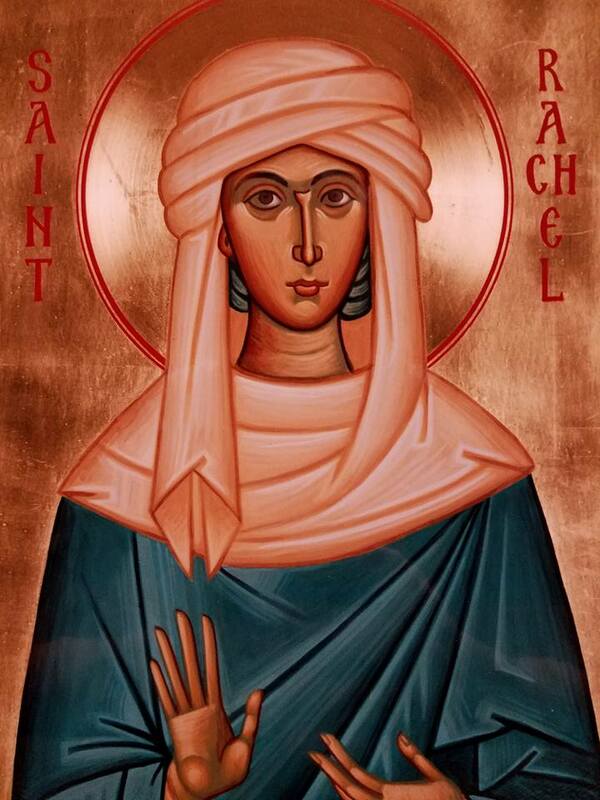 "Lord, please help me to remember my own death, and to keep it daily before my eyes." The crucifix is in a Benedictine style, with a medal of St. Benedict embedded in the structure of the cross. Around the image of St. Benedict is printed the Latin phrase: Eius in obitu nostro praesentia muniamur! It is a prayer asking for his presence at the hour of our death, because, like St. Joseph, he is regarded as a Patron Saint of a Happy Death. Ancient Christianity has placed a great emphasis on the importance of a holy death, and also on the importance of a holy life. The holy life, which is established by regular prayer and works of love, builds the habits of mind and heart necessary for us to choose a holy death at the appointed hour. Facing our fear of death over and over in prayer while meditating on the salvific events of Christ's life disposes us to have a more healthy attitude toward death as people of hope, people who can welcome death when it comes, not because it is an escape from suffering, but because it is for those who die in friendship with Christ an embrace of the Lord's presence in the Beatific Vision. Note: The above is an image of my rosary which has the Sacred Heart of Jesus depicted in the medal which joins the decades to the crucifix. 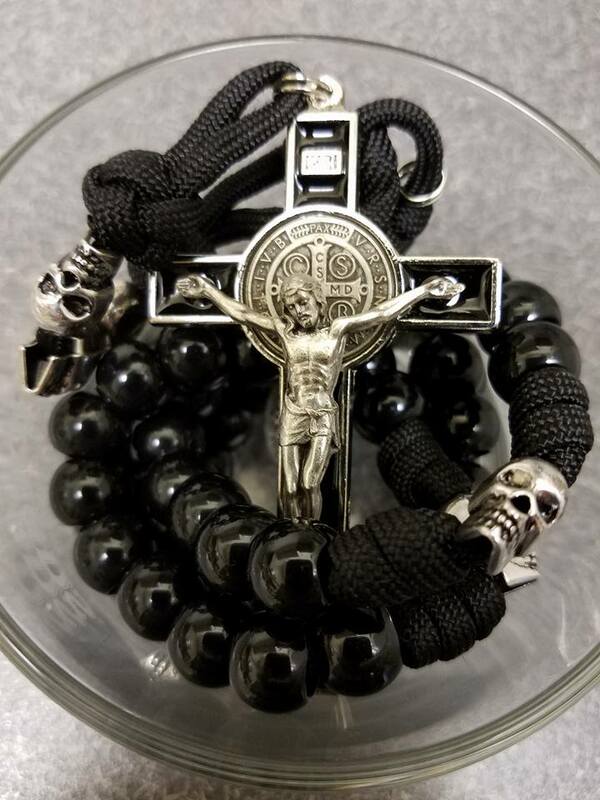 The large rosaries with silver-finished skull beads are from Rugged Rosaries. I highly recommend them for custom rosary designs that are both beautiful and extremely durable. may we conquer temporal pleasure in time. we proclaim Christ the Way, Truth, and Life. until death, ever praying for their salvation. us of our sins so that our hearts rest in You. 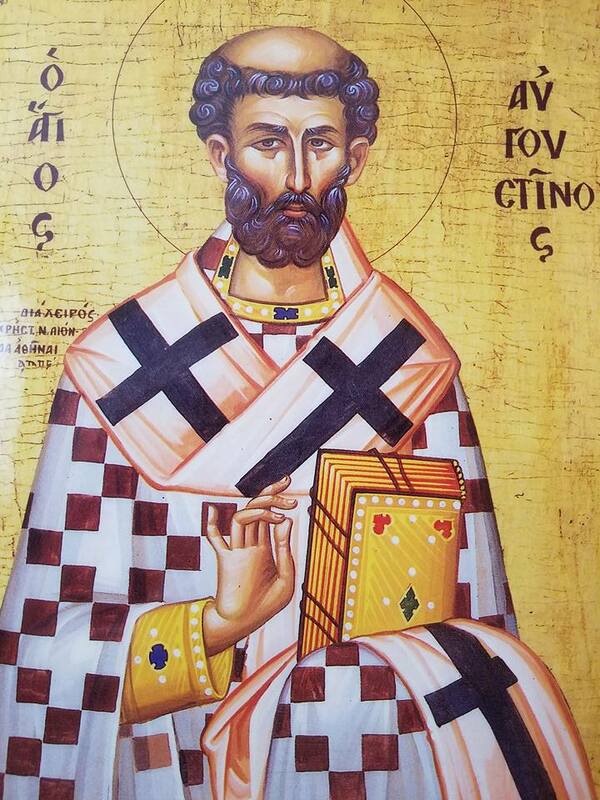 Note: The above is a picture of an icon I purchased from orthodoxmonasteryicons.com as a gift for a friend who has St. Augustine as a confirmation Saint. had much to learn of both earth and in Heaven. the Divine Logos, font of wisdom and reason. or pauper, who lay down their lives for Truth. sending forth prayers to You who are our Hope. 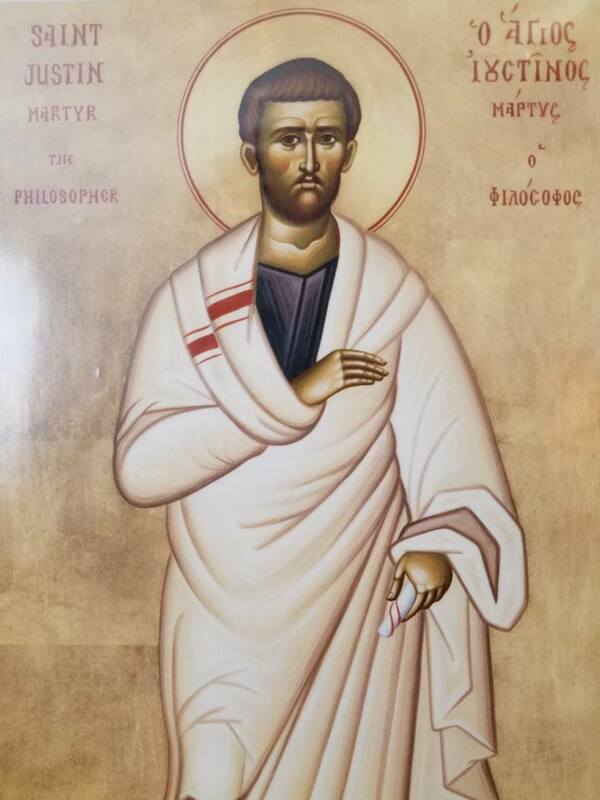 Note: The above is a picture I took of an icon of St. Justin Martyr, which I purchased from bostonmonks.com along with other great icons. I have a certain affinity for Justin Martyr, both because he was a philosopher and because the Catholic Church I started in during my conversion process was named after him. I recently enjoyed this video from the Atheists United channel on YouTube. They have many useful videos, and I encourage all who are interested in atheism to subscribe to it. Ryan Bell, formerly a pastor in the Seventh Day Adventist denomination, became quite the famous Internet sensation when he chose to live for a year as an atheist to see what it would be like. In this video, he explains why he was fired from his position as pastor, and how it impacted his family. But, more interesting to me, he explains some of the nagging questions he had faced during his journey to try to find the truth. One was particularly interesting to me as a philosopher. He asks, quite understandably, why anyone would worship the God that could be rationally argued for in a church every Sunday. After all, the God that can be argued for in purely rational terms is quite abstract, quite mysterious, even incomprehensible. This sort of divine principle, a sort of creative and yet impersonal ground of existence, the first cause, isn't the sort of God one can cultivate a relationship with, is it? How or why would we bother to relate to such a being? How would we bridge what seems like an immense chasm between us and such a God? I'll happily admit that we can't bridge the gap ourselves. Only God could do so. Hence the Incarnation. And hence the Crucifixion, the crux of the Incarnation. The Holy Cross of Christ is the bridge that allows us to cross the chasm between our humanity and the divinity of God. Christianity has the answer to Bell's very good question. To be fair, Hinduism does have an answer as well, via the avatars of Vishnu. Or Judaism via the Ark of the Covenant and their liberation from Egypt. Regardless, there is an answer to Bell's question here. It's not as if there was no answer to his question. He just didn't think it was an adequate one. Fair enough. We all get to decide whether or not we accept certain kinds of philosophical claims. C'est la vie. What I found wearying about Bell's story was not that he became an atheist, but rather that he did such a poor job of exploring Christian theology before he did so. The slow death of God in his intellectual life wasn't a matter of rejecting traditional Christian theology. It was a matter of rejecting, quite understandably, the bad theological work done by those who had, like him, rejected traditional Christian theology without understanding it. This certainly doesn't make him stupid. He seems quite intelligent and conscientious on the whole. But it does suggest that a sound understanding of Christian theology developed in the last few hundred years is inadequate to helping people of an intellectual bent retain their Christian spiritual life. Sound ancient Christian theology isn't just an optional luxury for a few academics that has no practical benefit for the average person. The benefit is clear: it's one of the few things that can provide a bulwark against (at least in the minds of modern thinkers) the slow death of God. your father dutifully, his flocks ever tending. the idols upon which you sat, a gentle dove. a sacrifice of praise, emptying out our coffer. who descended from thy son, humble Joseph. slain for our sins, the God of ages unto ages. Note: The above is a picture I took of an icon of Holy Rachel the Matriarch which I purchased from bostonmonks.com, along with several other icons. If the proverb, "Home is where the heart is" is true not just for our emotional lives but also for our spiritual lives, then I am spiritually homeless. My heart will not rest until it rests in the Lord, and so too my spirit. For many of us in the post-industrial West, home is a place of comfort. We can rest at home, taking our ease in relative safety. Our hearts can be at peace in the comfort of our home. This peace born of comfort and ease is, however, a peace easily broken by discomfort and unease. And life often upends our comfort and ease, thrusting us into uncomfortable situations. Life tends toward more difficulty rather than less difficulty, leading us into ever more discomfort and unease as we grow and age and learn to cope with the discomfort of growing and aging. If we allow this process to shape us for the better, then we will become less dependent on the comforts of this world, gradually shedding our attachments to its pleasures. This allows us to build our lives anew on a firm foundation, the cornerstone who was rejected by the builders of His day. In this way, our hearts are detached from the transient, unstable peace provided by worldly comforts so that we might be free to enter into the eternal peace which is given by the amazing grace of God. The end of the comfort and ease of a home for the heart can be a new beginning for a lasting peace of the heart. And so it goes for the spiritual life. Though having a spiritual home is pleasant and comfortable, I know from experience that there is a serious spiritual danger which flows from it. We can become too comfortable with the people who form the church community, the building in which we pray, the ministries in which we serve. There is nothing wrong with (and much that's good about) a tight-knit church community, or a beautiful church building, or serving in many ministries. Our attachments to these things is the problem, because they so easily take the place of our relationship with Christ. Attending a church can become primarily about seeing our church family, or enjoying the artistic and architectural beauty of the building, or serving in a ministry. While these are all good things, they ought to flow from a robust life of prayer and sacrifice of praise to Our Lord. So how do we know when we have succumbed to this spiritual danger? If a church which teaches all the same doctrines as the last one we attended isn't good enough to attend because it doesn't feel like the immediately welcoming church family we had before, that's a strong indicator of spiritual danger. If we refuse to attend the church and seek another one because of the beauty of the building, that's another strong indicator. If we shop around for a church in which we can participate in the ministry we enjoy participating in the most, that's yet another strong indicator of spiritual danger. These are not spiritual dangers because the ministry is not good, or because beauty is unimportant, or because the sense of community isn't wonderful. I am the last person to suggest that these things are unnecessary. In fact, I believe them to be quite necessary to a flourishing church life. The spiritual danger is at bottom the problem of selfishness. When our choice of church to attend is a matter of the Truth that transcends our preferences and even cuts against our preferences, it is not selfish to choose it. But when our choice of which church to attend is a matter of finding a comfortable-feeling church family, or finding the comfort of artistic beauty, or finding the comfort of ministry we enjoy, this is still selfish. This sort of choosing is building our lives upon the sandy beach rather than on the firm foundation of Christ. I recently left a church I had attended for more than 10 years. I went to a church with a much less beautiful building that is badly in need of renovation, a small-town community that does not even come close to feeling like family in the same way, and I'm not participating in the ministries I was involved in previously. That has all been very good for me. Though it may seem like a disappointment, I have very much benefited from a chance to reform my life, to let God point me in the direction of new ministries, to help increase the beauty of a church in need of it, and to understand once again what it is like to be an outsider so that I can better understand those on the margins. I am, as always, spiritually homeless. I live not in a spiritual house, but under the bridges along the river of love. And I am glad of it. Though I once saw spiritual homelessness as a condition to be escaped from, or ameliorated, or merely endured, I now see it in a different, healthier light. I now understand that to see that we are spiritually homeless is not to give in to hopeless resignation about the spiritual life, but rather a recognition of the truth of our situation in the created order: our spiritual home lies beyond this world. We will not find true peace unless it is the peace we seek from the grace of God. We will only find the lasting, eternal peace we long for in the eternal household of God the Father, when we are received in the heavenly household as adopted sons and daughters of God. The peace of Christ is not the peace of worldly comforts, even comforts in very good things, but rather the peace of the full communion of love which is the communion of saints in Heaven. Spiritual homelessness is part of the good life; it helps us to have compassion for those who do not have a home in which their hearts are at rest. And spiritual homelessness helps us to separate ourselves from even those good things to which we are selfishly attached so that we can grow in the divine life of Love. The life of spiritual homelessness is not a curse upon us by a malicious demiurge, but rather a blessing given to us by the God who is Love Himself. 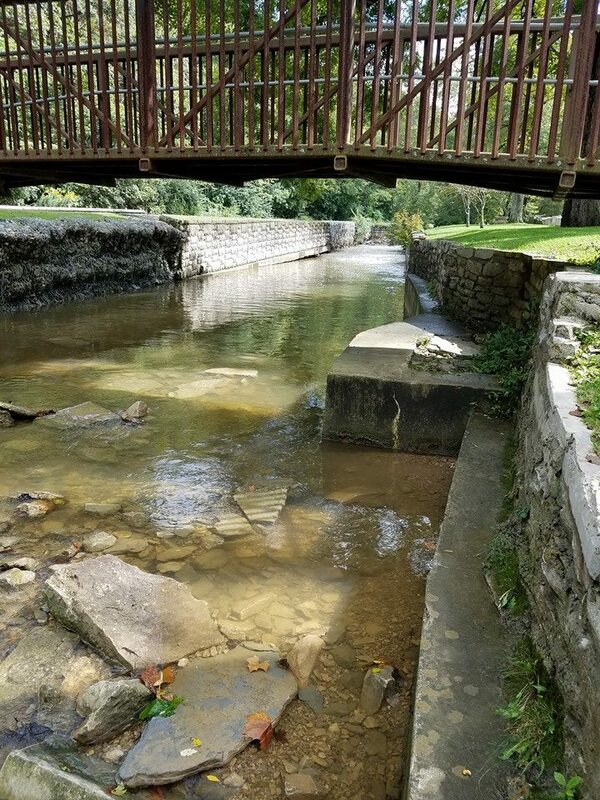 May we live under the bridges upon the river of Love in this world until we find the source and summit of the divine life in the heavenly household, our true spiritual home. Note: This is a picture I took while wandering in a park. I was not living under this bridge, though it is a very nice bridge indeed. 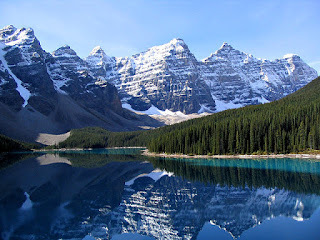 who created both the heavens and the earth. whom laid an evil spirit, a future truly dire. prayer, and obedience to the Lord our God. after God's own, and before His ark, dance. as we turn our desires to God who is just. Note: The above is a picture of an icon I purchased for my cousin from the Paracletos monastery. In a previous post, I addressed the question of whether or not Hebrews 9:25-28 is a refutation of the Real Presence and the Holy Sacrifice of the Mass. One of the claims I made in that post is one that I knew would be controversial among some Protestant exegetes. I know that because I used to be a Protestant, and even as an adult who has become Catholic, I've continued to dialogue with Protestant thinkers because they often have valuable insights and a broad knowledge of various Scripture passages. That said, one of the biggest reasons for my choice to join the Catholic Church was that I believed it to have a much more sensible way of interpreting Scripture. So I'm generally not in agreement with various Protestant methods for interpretation of Scripture, or hermeneutics as some call them. "These statements are pretty clear and are not a single isolated instance that can be read in a reductively metaphorical way." It's fairly well known to avid readers of the Gospels that Christ sometimes referred to Himself using metaphors, figures of speech which use images that are not literally applicable to them. When I write poetry, I often use metaphors, and I know from experience that there are multiple ways of using metaphors. One way of using metaphors is much like the use to which we put analogies in philosophy. In philosophy, we use analogies to illustrate principles that are not so easy to illustrate if we were to examine the object itself. For example, I might say that human reason is like the universe: ever-expanding, powerful, and worth exploring. Or I might say that human reason is like the universe: we can only see a small portion of it from our vantage point, we don't understand all that well how it works, and we venture into it untethered at serious risk to our lives. I have stated these as similes rather than as metaphors for the purpose of explanation, but I would employ them as metaphors in poetry. In poetry, I have used the vivid description of a flower to illustrate the human life cycle. Not exactly original, of course, but I use this example because it's typical of poetry. This use of a metaphor is the use of one concept to clarify another, the use of one image to bring another into sharper focus. In both cases, whether we use a metaphor as an analogy to explain certain parts of an abstract concept or we use a metaphor as vivid imagery of a concrete reality in order to make more clear another concrete reality, we cannot capture the fullness of the reality about which we write. Used as an analogy, a metaphor can only serve to illustrate certain parts of the abstraction on which we seek to shed light. Other parts inevitably remain in darkness, because analogies are never perfect. Used as clarifying imagery, a metaphor can only serve to make another image clearer; it cannot create the image by its own light. It must shed light on something that already exists. Such are the limitations of what I call natural metaphors. These are the only kind of metaphors I can use given my human abilities. My poetry, no matter how full of metaphors it might be, will never be able to illustrate every aspect of any object. I cannot suffuse anything with light with a word, nor bring into being anything by my words. Another way of using metaphors is what I will call supernatural metaphors. Just as the supernatural is even more real than the natural, encompasses the natural, and the natural world flows forth from it, so too the supernatural metaphor is more real than the natural, encompasses the natural, and its implications flow forth into the natural world. One who uses supernatural metaphors can indeed suffuse anything with light with a word, or bring anything into being by saying the words of life. 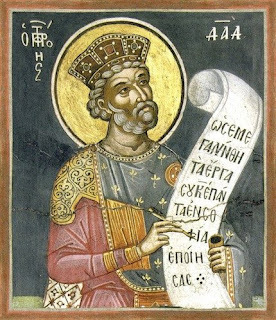 It is God, and the only-begotten Son of God, He who is the Light, and the Light begotten of Light, the true God begotten of the true God who can do this. Through Him all things were made, He who is the Word, one in essence with God who creates all things, one in essence with the spirit of God which hovered over the waters in the beginning when the world was created. When we speak, we speak as creatures who do not sustain the whole of creation, who are not the authors of all that lives, and moves, and has being. Our words have no more life than we do. Our natural metaphors are always less real than the fullness of created nature. God's supernatural metaphors are more real than the fullness of created nature. When God speaks, God speaks as the sustainer of the whole of creation; His words are the words of eternal life. The Word of God can not only make whole that which has become unholy because of the stain of original sin, but can also bring into being that which is new. The Word through whom all beings were created in the beginning is the Word through whom all beings are offered restoration to new life in the Garden. The Word of God can make the divine life manifest to us in new ways, showering us with divine grace so that we might grow into holy plants which can be grafted as branches onto Christ, the True Vine who roots us in the divine ground of existence. The Word of God can become for us the Good Shepherd whose voice we ought to recognize, who leads us into the pastures of Heaven, who carries us when we fall and cry out, for we are no longer able to walk on our own. He is the Good Shepherd who can judge rightly between the sheep and the goats, the shepherd whose staff brings us up to Heaven in the way we should go. The Word of God can give to us His very Body, broken because He so loved the world created through Him. The Word of God can give to us His very Blood in the humble chalice, poured out for the salvation of many, that we might once again have full communion with the divine. When the Word of God speaks, He doesn't stop at being a poet in the human sense. His divine nature encompasses the material world and exists eternally beyond it, overflowing with the Love that creates. And so the Word creates as He speaks, bringing into being that which is spoken by the Logos. When the Word of God speaks in metaphors, it is both the human and the divine poeia, an expression of the sacred act of creation. Supernatural metaphors are a part of the divine poetry, a weaving of the divine life's graces into material reality. Thus Christ the True Vine restores us to the Garden, grafting us as branches onto His Body, the Church, so that through Him we can be rooted once again in God, the ground of being. Thus Christ the Good Shepherd carries us on His Body, the Church, leading us when we are healed and can walk again to lie down in the verdant pastures of Heaven, resting beside the living water in the stillness of divine love. Thus Christ gives to the Church His precious Body and His precious Blood, the Bread from Heaven which He enjoins us to eat so that we might have life within us, the blood of Christ which we drink so that we will have life eternal. These supernatural metaphors used by Christ are not metaphors that are poetic merely in the sense that they provide us with an image to understand the speaker's underlying logic (though that's true as far as it goes); they are also metaphors that are poetic in the sense that they create within the temporal world the fullness of God's revelation to us, a bringing of the perfectly true, perfectly beautiful, and perfectly good heavenly reality into the good but imperfect temporal reality. This is the poetry of the one who loved us unto death, the creation of the sacraments given to the Church by Christ. Through the gift of His Body and Blood, His death on the cross, and His Resurrection, the divine Logos who is Love Himself wove the sanctifying graces of the divine life into our material world by speaking the words of eternal life. His words to us are the outpouring of grace upon the world, the poetry of divine love written upon our hearts by Love Himself. Note: This is a Russian icon cross I purchased recently. It's one of my favorites for theological reasons, presenting as it does the unity of the saving power of Christ in the Eucharist, on the Cross, and ultimately through the Resurrection.